Isaac Hernández Ceceña is staying in the ‘House of Migrants’, a shelter for migrants in Mexico supported by Caritas in Ciudad Juarez, northern Mexico. He is trying to return to New York State in the US to his wife, two children and the life he has built there over the last 14 years. Isaac is from Santa Cruz, in the state of Veracruz. When he was 17, he left Mexico for the US. If he left the US, he knew he would never be able to go back because of his illeagal status. But five years ago, Isaac married an American woman and once their first child was born, they decided to legalise their situation. But it led to an expulsion Isaac. The US administration withdrew the papers that provided proof of the exemplary life he had built as the manager of a dairy business in the country. “Stay apart from my family for 10 years? No way!” he said, determined to cross the border. “If at least I could bring my family here, to Mexico and offer them a future, then yes, but that is not possible. At the moment it is very tough in Veracruz, people are being abducted. It is very hard here with the Los Zetas cartel”. While Isaac is waiting for his chance in the House of Migrants in Juarez (the town Pope Francis is visiting on 17 February), he is also conflicted by being reunited with his parents. When he managed to pass the border the first time 14 years ago, he had crossed the desert north of Altar in Sonora on foot. A smuggler drew the route that he had to take, over eight days of walking. But the food and water that he was given were only enough for four days. He survived by drinking stagnant water and eating prickly pears. When he arrived, his nose was bleeding and he had wounds on his lips. From there, he easily made it to New York. Since then, accompanied by his sister, Isaac has tried to go through Reynosa. Their attempt has already failed four times. When they turned back to Juarez, they were kidnapped by members of the Gulf Cartel. They asked them for 4,000 dollars to cross the border. Isaac and his sister paid, but the gang caught them and imprisoned them for two months before they could escape thanks to some cunning and some more cash. Once in the city of Juarez, they were each asked for 7,000 dollars. The first half had to be paid in advance and the other once they arrived in El Paso, Texas. His sister did not want to carry on anymore, so she went home. Once again, he was ensnared. An armed man told him he could no longer chicken out, so he paid and he got in a car to end up being arrested by migration police. He was sent to prison for four months. Now he is waiting for better days in the House of Migrants in Juarez. The cold has also killed some migrants in the desert. 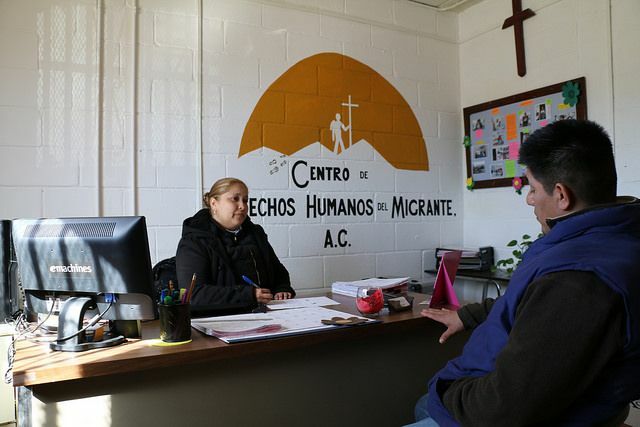 The House of Migrants is one of the 70 Catholic charity centres in Mexico. This hostel welcomed 6,458 people last year, mostly Mexicans, offering them food, a bed, a shower, clothes, a telephone, medical help, games, sporting activities and spiritual attention. “The home was founded by some Scalabrinians in the 80s, before passing to the Dominicans, to then return to the Diocese of Juarez,” said its director, Father Javier Calvillo Salazar. “It is a work of charity supported by the people themselves. The people help us more and more. I can’t ask for more for the migrants and the people we support,” he said. When they arrive, they are ill, and suffer all types of problems, such as injuries, heart attacks, or they are recovering from torture. There are also children on their own, as well as women, many of whom have suffered sexual assaults. “The most astounding thing is that no-one defends them,” said Father Calvillo. He thinks it’s great that the pope is coming to Juarez. “The Holy Father knows the land that he is coming to. It’s Juarez, one of the biggest migrant thoroughfares in the world,” he said.